Some eyebrows may have been raised when Gary Roberts’ name was announced on the team sheet as Wigan Athletic faced West Brom last weekend. But by full time, with a 1-0 win in the bag and Roberts starring with a tireless performance, most would have agreed manager Paul Cook made the right choice. More used to playing a supporting role in the squad, Roberts was thrilled to get back in the team owing to the calibre of player he is in competition for places with. “It was nice to finally get involved last weekend when I came into the team for our game against West Brom,” he said. “We have a strong squad here so to break in and get some minutes was nice. 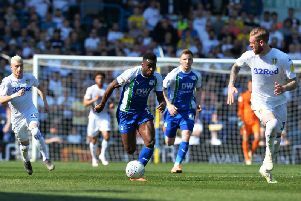 Latics will have to rediscover the magic of last week when they face Sheffield United, owing to their defeat midweek at Millwall, but Roberts said their last win at the DW showed they have the resilience to move on from disappointing losses. No one will need reminding the last match before the international break was a 4-0 nightmare at Preston, and Roberts said their success last weekend was down to sticking to Cook’s instructions. “We worked hard and the manager and the staff made sure we worked on our plan all week,” he said. “The way we wanted to play, we had to respect West Brom because they have so many threats in the team. And while some might be content with Latics simply staying in the Championship this term, Roberts insists the only aim in the camp is for them to finish as high as possible. Results at home against the likes of West Brom, Sheffield Wednesday and a draw with Nottingham Forest have proved Wigan have no issues facing big clubs. And the 34-year-old explained the way the players and staff are approaching this term. “We want to be at the top end – your aspirations are not just to knock about leagues,” he said. “You have to try and finish as high as you can to make it worth playing, even though we’ve only just come up. Some pundits and whatever will says it’s good just to stay up but we try and win every game and finish as high as we can. “There’s a good vibe with the staff, there’s no ‘us and them’. We’re one group here and you can see that from last year. We’ve kept a lot of the players, the core of the squad is still here, there’s a good thing going and hopefully it continues.” For Roberts, who might have to be content with watching from the sidelines more than he’d like, he is concentrating on other ways he can influence the team while he battles for a place. “In the meantime, my job it to just train and try and be a good character – be good around the lads, keep the lads going and try and get a game,” he said. “First and foremost you want to play. As well as being a good lad around the place, you want to play every game and I just work hard. “You don’t really want to be the ‘experienced pro’ but you can’t hide the fact I’m 34 and you do, you try and bring a little bit more of experience for the young lads. Being a good pro, looking after people and trying my best to keep the squad going. Play your part.